"Muscle cramps hurt, but in a good way." 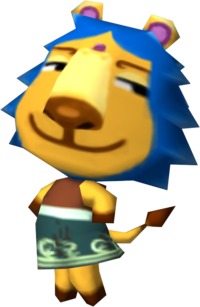 Aziz is a jock lion villager from the Animal Crossing series. He appears in Doubutsu no Mori, Doubutsu no Mori+, Animal Crossing, and Doubutsu no Mori e+. His name may be derived from azure, the color of his mane. Alternatively Aziz, meaning "strong," "powerful," or "respected," is a relatively common name in the Muslim world. Much of the natural habitat of the lion lies in the Muslim world. His initial catchphrase is "RAWR", the noise a lion makes. Aziz is a yellow lion whose mane is a deep blue. He has tan fur, while some parts of his skin are a light yellow color. He appears to have a dimple on his forehead, and the inside of his ears are lilac purple. His initial clothing is the Anju's shirt. The tip of his tail and the tips of his paws are brown, as well as his nose and eyebrows. Aziz is a jock villager, which means he is always bragging about how "buff" he is. In other words, he will talk about exercising. Due to conflicting lifestyles, Aziz won't get along with lazy villagers, or also question snooty villagers about their physical appearance, angering the snooty villager. Aziz will also offend or annoy cranky villagers. Aziz's house contains dark wallpaper and dark wood floors. He has a partition in his home as well. If Aziz has a stereo, he plays Lucky K.K. Aziz is a high-flying rug collector. This exotic lion has collected more than 20 different floor coverings-and his collection continues to grow. Now if he would just buy a chair, he could sit in his house and enjoy those rugs! Modified on February 22, 2019, at 18:03.